I look forward to the Tokyo Auto Salon every year. Each year seems to be bigger and better than the one before, except at the 2019 show there wasn’t anything new or groundbreaking. There were plenty of cool cars, lots of weird and whacky creations, and of course a few jaw-dropping moments, but it was a lot of what we’ve already seen in previous years. That is with one major exception: the new Suzuki Jimny. If there was an undisputed star of the 2019 Tokyo Auto Salon it would be the new Jimny. Every year there’s always a car tuners can’t get enough of. In the past it was the Lexus LC, Toyota C-HR, and Mazda MX-5, but I hadn’t seen anything quite like how the Jimny took over TAS. It was as if a case of Jimny-fever had spread throughout TAS and there was no stopping it. The Jimny is a total classic in Japan, with an ardent following and off road scene. Old ones are cheap to buy, easy to own, and much more capable than you’d expect. The old two-stroke ones are rusting out, but old Jimnys are still treasured. Well, they’re used and used hard, but loved all the same. So it’s not hard to explain how much love and hype there is around the new Jimny. It’s simply a very loveable and likeable car, an off-roader that’s unashamedly honest and affordable. I think that’s the key to the Jimny’s success. Whereas so many small off-roaders these days have a whiff of pretension about them, with little to zero off-roadability and cost significantly more than the Jimny, Suzuki kept the fourth-generation true to its roots. You know Jimny-fever has reached its peak when even Suzuki themselves presented a pair of off-road concepts at TAS. There’s the Jimny Survive, based on the smaller kei version of the vehicle. You can see it in the back there, in grey. It’s like a post-apocalyptic version of the Jimny but even that was overshadowed by the beige concept next to it. The fabulously named Jimny Sierra Pickup Style is exactly that, a Jimny pickup. The combination of the exterior paint, the massive chunky wheels, the raised suspension, and the tartan seats made this my favourite take on the Jimny at TAS this year. Suzuki says these two are purely concepts for now but with everyone going crazy for the Jimny they’d be fools to not give the people what they want. And we want a beige Jimny pickup with tartan seats and a rhino decal. Continuing on the lifted theme was the NATS Jimny Adventure. 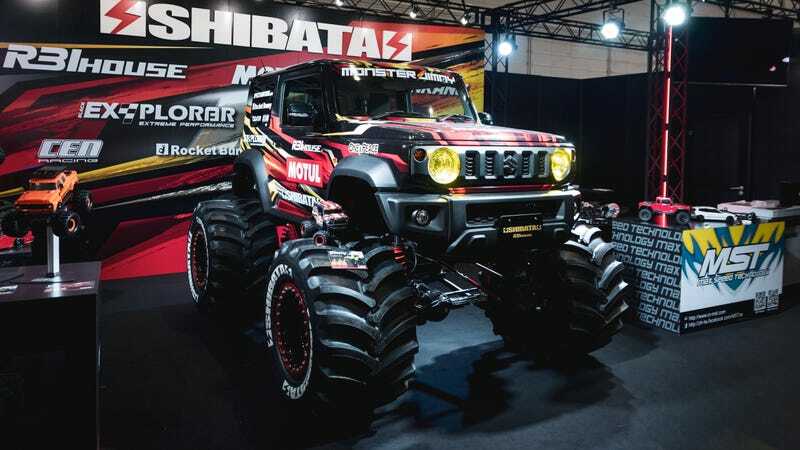 Made by the Nihon Automobile College, it was the students’ take on how they’d envisioned the ultimate all terrain Jimny. They even displayed it ‘rock crawling’ to show just how much of a serious off roader it could be. The removable rear canopy and the retro wing mirrors gave it a whiff of Land Cruiser/Mitsubishi Jeep/Wrangler about it, which was very cool. There’s a recurring theme with the names of the Jimny concepts, such as Survive and Adventure. It plays on the Jimny’s go-anywhere capabilities and all the modifications kept the Jimny a true off-roader. One thing I noticed about all the various takes on the Jimny was they all either maintained the same ground clearance as the original car or were raised. There weren’t any slammed Stancenation style modifications, yet. I assume someone will do that for TAS 2020. At the Liberty Walk stand their Jimny kit got a lot of attention. Talking with Toshiro ‘Toshi’ Nishio, Sales Manager at Liberty Walk, he said they had received over 40 orders for their Jimny kit in the three days TAS was held. Interestingly, half the orders came from overseas customers. The Liberty Walk kit for the Jimny only came about when Kato-san wanted it to accompany their new kit for the Mercedes G-Class. The LB kit turns the Jimny into a G-Mini (geddit?) and comes with the front bumper, grille, wide fenders, rear wing, front roof spoiler, and bonnet scoop. The total cost is $5,570 and Toshi said owners can choose for themselves if they want to raise, lower, or keep the standard ride height. Toshi was surprised when I told him how nearly every other booth had their own take on the Jimny, too. Liberty Walk weren’t the only ones to do the G-Mini pun, the catchy-named OEP222 also did the mini G-Class look for the kei version of the Jimny. But instead of basing their look on a normal G-Class, the OEP222 was more like a miniature version of the G 4x4 with its bright yellow paint job. Perhaps it was because of this it took home the prize for the Kei Car Custom category. Another award-winning custom Jimny was the Black Bison kit by Walt International. With its matte black paint, side exit exhausts, and red LED surrounds, it was a properly mean looking thing. This got the top prize for the SUV division, with DAMD’s Little G Sierra being the runner up, which as you guessed from the name is another G-Class lookalike. DAMD also has a Defender lookalike kit hilariously called the Little D, as well as some amazing interior options for their Little G and Little Ds. The Jimny took home a lot of prizes this year but as cool as the Black Bison was, it was the Jimny next to it that really caught my eye. The only other Jimny pickup at TAS, the N’s Stage Jimny had more of a stubby back than the bigger Suzuki Jijmny Sierra Pickup Style. Not quite as utilitarian as Suzuki’s take but in my opinion equally as cool. It’s something I’d imagine a Japanese Tomb Raider would rock. What confused me was I left the stand for a couple of minutes and when I came back to look at one of my favourites from the show again, a large crowd had gathered as N’s Stage thought they needed to put some models in front of the Jimny to draw in more attention. It was unnecessary as the cars were already interesting enough. This became a common issue with the Jimnys, there were models constantly in front of them. I get why other ‘lesser’ cars would need them to boost their appeal but the Jimny does not any help boosting its appeal to crowds. One exhibitor even went as far as putting some poor girl in the back of a Jimny. At least she had some props to keep her occupied. Other highlights include the pink and white Jimny which according to my American friends was reminiscent of a Ford Bronco. There was also another Jimny displayed next to a rather tropical island looking background, I guess to show it can work on a sunny beach too. Finally, the craziest Jimny of all was the ‘Monster Jimny’. As if you didn’t think Jimnys could get crazier or bigger than the NATS Adventure, in comes this thing. It was the work of 1980s R31 Skyline experts Shibata R31 House and RC and truck manufacturer, CEN Racing. The 1:1 car, erm, truck even came with a more affordable 1:10 RC version, too Presumably that’s the one they’ll sell. So that’s the Jimny at TAS 2019, there’s a lot of minor customizations and a few totally out there ones. Since the Jimny is relatively new here’s hoping there’ll be more variation in the modification of Jimnys next year. That is, if everyone isn’t too busy modding the new Supra.